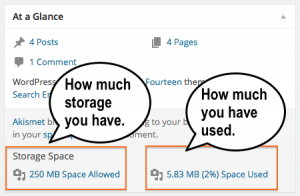 All UCI Sites sites and blogs come with 250MB of storage. 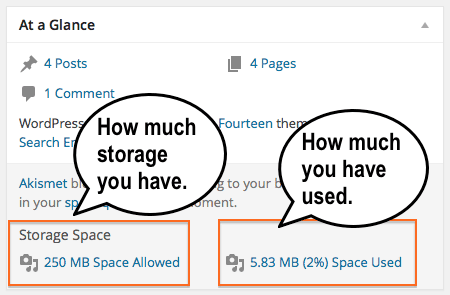 This storage space limit is only for media uploads like images, files (PDF, Word, Excel) etc. It does not affect how much content you can write and publish. Login to your site or blog. In your Dashboard, look in the At a Glance pane. At the bottom of the pane, you should see your Storage Space limit and how much you have used. Resize your images before you upload them. Modern digital cameras, including camera phones, take high resolution images which also have large file sizes. Using the high resolution images are not necessary on a website or blog. They will slow down your site as your readers try to download the full size image. View your uploaded files including images. See if you have duplicates and delete them. If your site has a lot of images and you need them to be high resolution, you can host them on another service and add them by URL. For example, Flicker.com is a photo sharing website that offers 1 Terabyte of storage for free. UCI Google Apps may be another option for image hosting. Adding an image from an external website. I’ve tried all the tips, but am still over quota. Contact us. We may be able to increase your quota. Please keep in mind that this is a shared service. We host more than 2,500 blogs and websites.